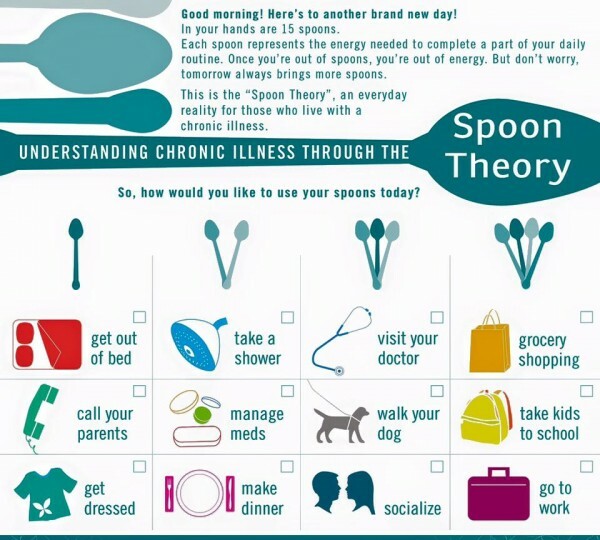 This is the "Spoon Theory" that will explain how it is to live with chronic diseases, 24 hours pain and chronic fatigue that does not go away no matter how much you sleep. It takes 1 spoon to get out of bed and then 1 hour before the medication starts to work. Then 1 spoon for coffee and breakfast. At least 2 spoons if I need to shower and 1 spoon to get dressed. Up to 3 spoons if I need to go grocery shopping. If I go into town, it takes a minimum of 4 spoons, many times more. Vacuuming is 2 spoons, mopping the floors is 2 spoons, and laundry are 2 spoons. Dishes is 1 spoon, cooking 2-3 spoons depending on what needs to be done. In addition, all the little things we all do every day and not think about; 1 spoon for everything. What can you think of in the course of a day? I would like to hear it in the comments and see how many extra spoons I need. Is it not because I will not be with you, or would like to invite you home, I just do not have more spoons. However, tomorrow there are 15 new spoons, minus the extra I used today. This is a very good way to explain to family and friends how it is to live the life we live. You gave me so many spoons in October with all your engagement and work. We had so much fun and you didn`t care that the flat was not perfect when you were here. Sending your presents in a few days along with your shawl. Aww, you're soo sweet :) And I'm soo behind again :D I don't know where the time goes! That is what I want to explain here. You will always get coffee or tea, snacks and a cooked meal if you show up. But you have to forget the dust and mess if you don`t give me a day or to of notice. Most people understand and accept it, but some people (BRO, SIL and SIS) don`t understand. Jeg har sendt deg en mail med den nye adressen min :), Skogveien stemmer ikke lenger. Different things take up different spoons depending on what's flared up- I literally couldn't take off my shirt last night. It's a good start, though! Some days I don`t have any spoons at all and can not get out of bed. So the 15 spoons are used in very diffrent ways on diffrent days. This is a really helpful way to explain and understand the pain that you suffer. I'm reading this and feeling really really lucky and blessed that I'm healthy and don't have to count spoons. I wish I could give you more, sweetie! Also, as everyone has said above - anyone who's worth your time and love wouldn't care about a bit of dust in the house! If I was close enough to visit, I'd actually be mad at you if you'd wasted spoons cleaning because I was coming! I wake up and always only have three, lol! !